Joel Evans, 7, and his mom, Sabrina Evans, laugh at their home. (CNN) -- The afternoon of December 3, Sabrina Evans dressed her boys in their new plaid Christmas shirts and readied herself for a night out. For the kids, 5-year-old Chase and 7-year-old Joel, there would be a photo with Santa at the mall in Athens, Georgia. For the entire family, an Italian dinner at Carrabba's. Sabrina and her husband, Tyler, were celebrating their 14th wedding anniversary. Every year since their sons were born, they'd taken the boys along for their anniversary dinner at Tyler's favorite restaurant. The four piled into their old Cadillac CTS around 4:30 that afternoon. They stopped at Tyler's parents' house to look online for the best places to spot Christmas lights. They didn't have their own computer yet; after living with Tyler's parents, Joe and Betty Evans, for more than a decade, the couple had moved into their first new home just a few months earlier. It was new life for the Evans family, with all their beloved traditions: the anniversary dinner, the holiday lights, a visit with Santa. On his way out, Tyler placed his hand lightly on his mother's hip and gave her a kiss on the cheek. "I love you, Mom," he told her. "I'll see you soon." But that was the last time he would see her. Around 6:10 p.m., before dinner, before Santa, the family was in a car accident that left 37-year-old Christopher Tyler Evans dead. 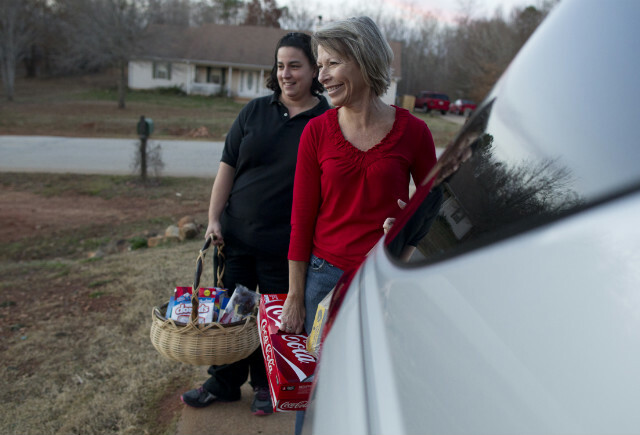 Since then, the community where the family lives in Newton County, Georgia, has stepped up to provide Sabrina and the children with food, gifts and moral support to help them make it through not only their first Christmas in their new home without their father, but also the boys' first birthdays without him this month. There is no replacing a husband, no replacing a father. But this Christmas, the Evans family is flush with support it had never before known was there. Hundreds of people showed up for Tyler's funeral on December 7, many of whom Sabrina Evans, 35, and her in-laws had never met. "When a family experiences a tragedy like this one, it touches the whole community and makes them want to pull together and surround them with love," said Jan McCoy, associate pastor of the Covington First United Methodist Church, who presided over Tyler's funeral. 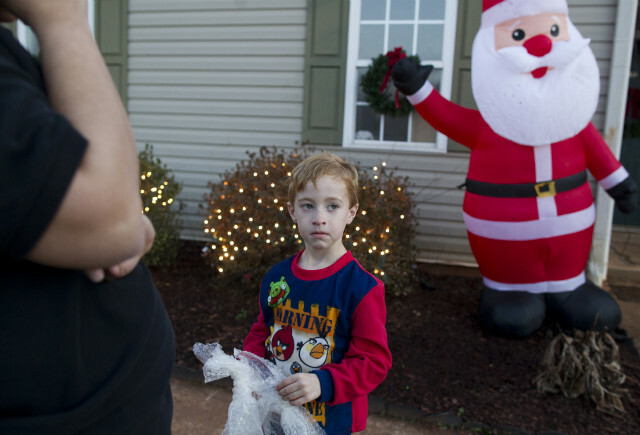 Standing with his mother, left, Chase Evans, 5, plugs in an inflatable Santa Claus at their home. "What helps them more than the material gifts is what's behind them, and that's the love and the support of the community." Sabrina and Tyler Evans had made it through plenty of ups and downs. The couple met in 1992 during high school in Slidell, Louisiana, where Sabrina was born and raised, and where Tyler had lived since he was 2. He was a high school athlete who excelled in soccer and baseball, pastimes he would later share with his sons. They were introduced through mutual friends when she was 15 and he was 17, and grew close after Sabrina had ankle surgery. Her father had died when she was 9 and her mother worked long hours to support four children. Most nights, Sabrina was left at home to heal alone -- except for Tyler. When he didn't have to work, he cared for her as she recovered, Sabrina said in an interview in her Covington home last week. "He was just nice and kind and we got along well," she said. "When you live with someone for so many years you just get used to each other. We'd been together for 20 years, which seems rare these days, especially among the people I grew up with." After Tyler graduated from high school he worked a string of restaurant jobs in nearly every position, from prep cook to manager. 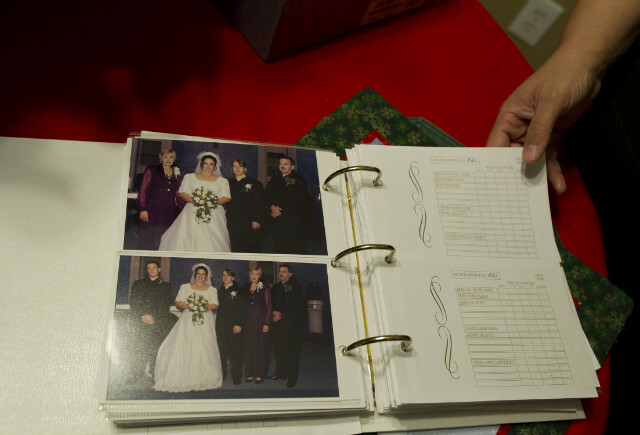 The couple married in 1998 in Louisiana in a Catholic ceremony at the behest of Sabrina's grandmother, but only after taking a class to earn the church's blessing after living together unmarried for several years. An album of wedding photos shows the dark-haired bride dancing in the arms of a blond, long-haired groom a few inches shorter. She flips through the pages identifying guests, many of whom have passed away, like her husband, far too young. They moved to Newborn, Georgia, in 2001 to be closer to his family while Tyler healed from a back injury. They opened a restaurant in 2008, Tyler's dream job, but were forced to close after two years because of the economic downturn. Otherwise, he struggled to hold down jobs for extended periods because of his back injury, his wife and mother said, leaving the family to live mostly on Sabrina's earnings from Kmart and later, Dollar General, where she currently works. Still, they took beach vacations to Florida and South Carolina whenever possible, even after Sabrina gave birth to their "miracle babies" -- Joel in December 2004 and Chase two years later, in December 2006, following three miscarriages. "He lived for his boys. Everything he did, he did for them," Sabrina said. "He loved them more than anything on this earth." He enjoyed being a father and sharing his passions with his sons, from baseball and fishing to sitting with them on the couch, watching wrestling, she said. The entire family trekked to Atlanta for WrestleMania 2011; Chase, who was 3 at the time, fell asleep in his mother's arms. One of the boys' last outings with their father was to Turner Field, home of the Atlanta Braves, for Chipper Jones' last game. With their fair hair and big blue eyes, both resemble their father as a child, grandmother Betty Evans says. But the older son, Joel, also shares Tyler's outgoing spirit and seemingly permanent broad smile. "When I look at him, all I see is his father," she says. The family stayed with Tyler's parents until July, when they finally bought their first home in a cul-de-sac in a remote subdivision in Covington. Their house had a big front yard where Tyler, a high school soccer star, would kick the ball around with his sons, Sabrina said. 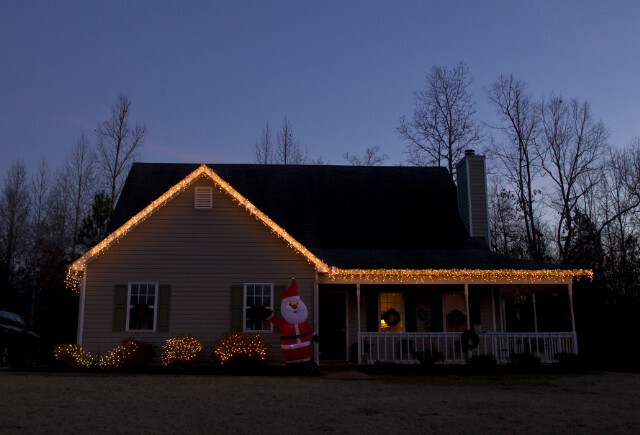 White lights hang from the roof and a larger-than-life inflatable Santa Claus greets visitors at the front door, courtesy of Tyler's brother, who put up the decorations while he was in town for the funeral. Sabrina Evans looks through wedding photos. Tyler was unemployed on December 3, making the family outing all the more special at a time when the family was watching its finances. Still, happiness over a season of new beginnings imbued their home. This December would bring the boys' first birthdays in their own home, the couple's first wedding anniversary there, the family's first Christmas there. According to a police report, Sabrina Evans failed to yield while making a left turn at an intersection. A Jeep hit the passenger side of the vehicle, where Tyler Evans was seated. All Sabrina remembers is her son Joel screaming. By 8 p.m., Tyler was dead. News reports identified him as a "Newborn man" because he had yet to change the address on his driver's license from his parents' home. Miraculously, his wife and sons survived with just a few bruises, though since then, Sabrina's shoulder has started to ache, making it hard to do her job stocking inventory at Dollar General, she said. When police came to Sabrina's bedside to deliver news of her husband's death, she remembers offering up her wrists and asking if she was going to jail. They told her no, that it had been a "horrible, horrible accident," she said. They ordered blood and toxicology tests, customary in cases of vehicular deaths. The case is still open pending final test results, Lt. Don Eckert of the Athens Police Department said, but he does not expect charges to be made. Drugs and alcohol are not believed to be involved, he said. Christmas lights decorate the house recently bought by Sabrina and Tyler Evans. "Some cases hit home more than others," he said. "The circumstances of this case could've happened to anybody." Still, the widow is haunted by guilt. She was in the driver's seat, after all. "I don't know if I'll ever get over it," she said, casting her eyes down. "That'll be my punishment the rest of my life, to live it, knowing that I was behind the wheel when my husband died." Perhaps it was the terrifying possibility of a father's death, or the swiftly approaching holiday, or the joyous night turned bad -- but grief poured from the people of Newton County. Covington, a large, semirural community about 40 miles from Atlanta, is known for its picturesque square, which has been the backdrop for films and TV shows through the decades, from "In the Heat of the Night" to "The Vampire Diaries." Each December it turns into a holiday wonderland of bright lights and garlands that hosts a variety of Christmas-related events, from pictures with Santa to holiday concerts. Many of its residents have called Newton County home their entire lives, contributing to a tight-knit spirit, said Amber Pittman, senior reporter for the Covington News. "Many residents of Newton County still think of it as a small town and when one of your own is hurting or in need, you give," Pittman said. "This is your worst nightmare. ... One day you're heading out to family dinner and to see Santa and the next day your dad is dead. It's just unbelievably sad." Her reporting on Tyler's death led the Covington police to reach into its "Police Who Care" fund. Even before Sabrina had buried her husband, the Covington police showed up at her home with $800 in gifts from Walmart: mostly toys, video games and anything related to Batman, as the boys had requested. The gifts were presented to the boys by Santa Claus -- the symbol of Christmas spirit they'd missed seeing the night their father died. Everyone was touched by the joy and gratitude demonstrated by the two little boys, who seemed to have forgotten for a moment about their father's absence. Their faces lit up as they entered the home to find Santa and nearly 20 police officers, in an exchange Pittman described as heartwarming and that was featured on local television news. They made sure to hug and thank all the strangers present, Pittman said. Later in the week, after she'd buried her husband, Sabrina Evans stopped by the newspaper's office to drop off a thank you card. It's far from the only kindness to fill the family's home this month. The boys' teachers from Mansfield Elementary School chipped in and brought food to the home twice. A toy store in Athens invited the boys to meet Santa and pick out gifts on Chase's sixth birthday. The towing company that removed the family car raised money for a toy drive. A stranger bought Sabrina a spa package. Atlanta Braves players Brian McCann and Jason Heyward signed jerseys for the boys. Sabrina, left, and Cindy Hensley, Chase's kindergarten teacher, watch the boys play in the yard. Others are thinking beyond December and into the new year, when the real work of starting a new life without their father begins. That's when Joel's second-grade class intends to start helping the family out in some way, perhaps with a meal every so often or a tree planted in Tyler's memory. "When the holidays are over and they get past all the busy-ness of Christmas and the boys' birthdays, I feel like that's when it's going to get tough," said Karen Piper, a lifelong resident of Newton County. "That's when we'd like to step in." While the circumstances of this tragedy are extreme, the response is typical for the school, whose motto is "We are a family," she said. When a bus driver retired last year because of chemotherapy treatment, the staff took up a collection. As soon as teachers learned about Tyler Evans' death, they activated a prayer chain with the family's permission. The outpouring of support is a bit overwhelming at times, Sabrina said. The season will likely be tempered with sadness for years to come, but the community support now helps the family to cope. "I'm not the type to ask, 'Hey, can you watch my kids?'" said the 35-year-old widow. "I'd rather do without than ask for help. But the way the community has reached out, it changes your outlook on people." The kindness helps the community to grieve, too. "When I think about what we do every day and the tragedy and heartache we see and try to help people through, this is a wonderful way to help us cope," Covington police Capt. Ken Malcom said. "When we see so many negative things, catastrophic things that happen to families, feeling good about something helps us, helps us cope with having to deal with so much tragedy." When a family experiences a tragedy of this magnitude, it touches the whole community, said McCoy, the pastor. "It reminds us that none of us are promised even the next five minutes and to make the best and most of what have," she said. "Make those memories last, because if you put it all off until tomorrow, there might not be a tomorrow."